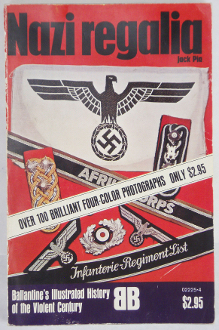 Nazi Regalia by Jack Pia – Soft Cover This book serves as a reference and identification guide for Nazi items. Book shows a lot of wear with curling of the cover and many dents & handling marks. Nice soft cover book for the collector. Color illustrations. Measures 5 1/2” x 8 1/2” soft cover.